Author and yoga instructor Ryanne Cunningham lives in the Green Bay area, where she works with team members of the Green Bay Packers as well as athletes in other sports. 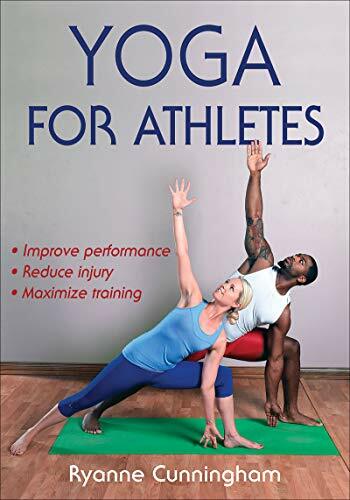 In this book, she argues that yoga can serve to enhance the already rigorous training programs of both professional and amateur athletes by brining greater balance to the entire body. Some of the benefits she postulates include assistance with muscle recovery and injury prevention, plus reducing stress, increasing focus, strengthening underused muscles, building the core, and improving sleep. Chapter 2, "Getting Started," focuses on props, the breath, and warm-up movements. Several poses are introduced here as preliminary stretches, leading into the following chapter, "Warming Up," which continues with opening flows. Using full-color photographs and detailed explanations, Cunningham provides instruction for Sun Salutation A and B. For each posture in these two series, modifications are offered. Cunningham also describes what she calls an "Athletic Variation," a quick overview of yoga jump-backs. In the next several chapters, Cunningham presents additional yoga poses, utilizing the same format of text instruction combined with photo illustrations. She organizes each chapter around a particular area of the body, including Hips, Hamstring and Quadriceps, Spine and Core, Upper Body, and Balance Poses. The last chapter in this section deals with cooling down. In addition to providing postures for the end of a yoga practice, Cunningham reviews some basic options for meditation; she ends with information on visualization, connecting this technique to athletic performance. Part II of the book addresses sports-specific issues. The sports covered include football, running, soccer, cycling, baseball and softball, swimming, tennis, basketball, golf, and high-intensity training. For each sport, there is a particular intention for the yoga stretches: for example, freeing tight hips for cycling and lengthening/rotating the spine for golf. The 9-12 poses per chapter emphasize the intended focus area for that sport. Many of the poses included in the individual sports chapters are also presented earlier in the manual. For those who prefer to pick and choose postures to formulate their own practice, a complete "Pose Finder" is included as a reference. This book is impressive in appearance, with thick, glossy pages and a plethora of color photographs featuring a variety of models. However, as a yoga teacher myself, I question how some of the information is presented. First, there Cunningham fails to cite references as to the benefits of yoga. Being a strong proponent of yoga, I know that there is scientific research to prove its value—and yet I am also aware that there is little evidence to support broad-based claims (e.g., yoga "prevents injuries"). Second, I found the introduction of the postures to be somewhat awkward. In the first chapters, Cunningham includes poses that I rarely teach in my own beginners classes, such as upward-facing dog. Along these same lines, Cunningham seems to assume that athletes will automatically be able to achieve quite challenging postures (examples include twisting triangle, revolved half-moon, reclining hero, and the above-mentioned jump backs) regardless of their level of yoga experience. Personally, I generally have found the reverse to be true—i.e., because athletes tend to have more developed muscles, they can find it harder to attain postures that require a high degree of flexibility. I have no doubt that some will find this book very helpful; I can certainly see its utility for those already familiar with yoga and/or those who have the self-awareness to adapt postures to their abilities as needed. For others, I would recommend seeking out a yoga book geared to beginning yoga practitioners, or even more ideal, attending a live class with a qualified instructor.